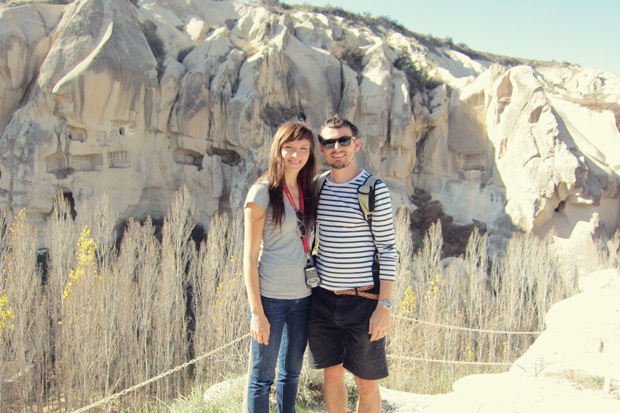 We took a short 15 minute walk from our cave room to the Goreme Open Air Museum, which was highly recommended by everyone including UNESCO since they put it on their long list of special places. The museum resembles a vast monastic complex composed of many monasteries, a 6-7 story nunnery in good shape, and some of the finest rock-cut churches with beautiful frescoes. Amazingly, the ancient frescoes still retain their original color and freshness because of the lack of sunlight in the structures. Pictures were strictly prohibited inside the churches, but we're rebels and knew you guys would love to see photos of the frescoes, so we did our best. The museum has been part of UNESCO World Heritage List since 1984 and was one of the first two UNESCO sites in Turkey. Most of the churches in the museum belong to the 10th, 11th and 12th centuries. In the photos below, you can see red/orange dye in a few of the churches, which was used to paint unusual geometric symbols and other decorative art on the ceiling and walls. To be honest, it looks like a kid drew these with a crayon but I'm sure it was a lot harder to do than it looks. In later years, some of these drawings were covered with beautiful frescoes. What we saw was dramatically difference from the churches we've seen in Europe. In Europe the churches are grand and sophisticated. In Cappadocia, the churches are very small and humble, with childlike shapes and drawings in some. Although Cappadocians had to hide their Christian faith and live in caves, this didn't stop them from building many, many churches, as simple as they were. I cannot get over how amazing this place is. Wow, how interesting! Beautiful photos as always! Happy travels and Happy New Year to you two! these pictures literally made me breathless! they are so gorgeous. i'm glad you decided to be rebels and take these pictures. i have never seen anything like this in my life! This is breath-taking. Thank you so much to the two of you for taking all of us on this adventure with you. I have never seen someone document a trip more beautifully with such special care to detail - it really feels like we're all along for the ride. Being 6.5 months pregnant, I am full of wander-lust and a desire to just take off, but I am grounded for a few more months. So thank you for the little trip across seas every time I visit your blog! Happy New Year, you two. Wow, such amazing sights! Truly awe inspiring. Incredible! I love reading your blog...thanks for sharing! Oh god just found your blog and it's amazing!! Those photos are gorgeous! Very beautiful!!! Keep updating your blog with valuable infomation. Thank you for the post. Aura- Wow, good luck with the next three months! We love having you along for our trip. Zhanna- That is too sweet. If our kids end up thinking their parents are utterly uncool (very likely), we'll ask you to have a talk with them.